Lately the topic of compassion fatigue has been coming up for me over and over again with my clients. Night time yowling cats, banging dogs, dogs that need check ins every few hours or six meals a day. It’s exhausting! I’ve written so much about animals on this blog, and how to treat them in hospice, and how to care for them well, and how to make them better. But I feel like I need to write more about the wonderful caregivers who care for these loved animals and who don’t always take good care of themselves in the process. Did you know there’s a difference between a caregiver and a caretaker? I learned this recently. A caregiver is someone who gives care to another person or being with love, because they choose to, and with no resentment. A caretaker is someone who gives care to another without those elements. It doesn’t mean that they are a bad person, that they’re flawed in some way, or that they’re doing anything wrong. In fact we often times swing between caregiver and caretaker. One of the biggest elements in the swing is self-care. No matter how much we love a person or animal, we will build up resentment if we’re not taking proper care of ourselves. It is not selfish to put ourselves in front of those we are caring for. In fact not only is it not selfish, but it is necessary for us to care well for another being. One of my counselors once told me about the pitcher and the bowl. If you put a pitcher in the middle of a large glass bowl and you fill the bowl with water, the picture will fall over. If you once again put the pitcher in the middle of the bowl, and fill the pitcher with water first, the pitcher will fill, stay firmly planted, and then will overflow filling the bowl. We are the pitcher and we must fill ourselves before we can get to others. Otherwise we will topple over and not only not be able to take care of ourselves but not be able to take care of anyone else either. We give better care when we take care of ourselves. This is extremely hard to do in a society that value self-sacrifice and makes self-care out to be a selfish act. It is even harder to do when sometimes we feel it means that our loved ones do not get quite the care that we wish we could give them. Yesterday I went for healing session for the first time with Virginia Rain down the street. She posed the question to me, what if your body was your pet? How would you treat it then? It’s an interesting question. Even those of us that do quite a bit of self-care, exercise, eating well, sleeping well, we don’t always take proper care of our body. We take it for granted that it’ll be there to support us and we don’t honor it or care for it like we would our beloved companion animals. 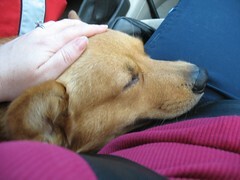 So what are the most important elements of self-care so we can be good caregivers to our animals? Number one is sleep. Without sleep it doesn’t matter how much self-care we do we’re good to be a mess. Our body needs 7 to 9 hours of sleep a day. Most people I know don’t get this and most people I know taking care of a hospice animal really don’t get this. So what does this mean? It means that sometimes we have to put our animals in a different room and ignore their whining, pacing or yowling so we can sleep. This is one of the most difficult things to do for caregiver. But it’s also the most important. If we cannot do this, then sometimes we have to enlist help from a spouse, a friend, or someone else that can help us have time to sleep. Another important thing is making sure that we get self-care for our body. Especially with larger dogs that need to be lifted and moved, we need to keep our body in good shape. Throwing your back out when you have a 70-pound dog you need to carry around is not going to be a good plan. And the time to deal with that is in prevention and not waiting until it happens. Body care can include things like getting acupuncture, bodywork or massage, chiropractic adjustments, and making sure that we have time to stretch and exercise. One of the main reasons I started Kingdom of Basil was so my human caregiving clients could get their own healing care in the same building as their animal companions. Emotional well being is also extremely important. It is so easy to just shove our emotions deep into our body because we don’t want to feel them. Hospice care is hard and a lot of grief comes up around watching our loved ones slowly pass away and struggle. Pushing our emotions down only makes us more ill. It’s important to have an outlet for emotions. This may be a support group, a trusted counselor, an energy healer, or someone else who can help us do release of these emotions. While this last suggestion may not seem that important, it really is. We need to continue to have a life. Hospice care is so emotionally draining that having some normality is really important. We need to still take time to get together with friends, to go out to eat, to connect with other people. This all will help us be better healers for our animal friends. Often times help is needed with this also. Many cities have people with businesses that can help take care of hospice animals. In West Seattle, two of my clients retired and started to pet care business. They’re able to help out with the midday care, veterinary appointments and have experience taken care special need animals. Look for something like them I’m in your city. I think one of the most important things to remember about hospice care it is to be gentle to ourselves. No one can do it perfectly. We can’t always be there. I think a good start is to treat ourselves with the same kindness that we treat our animal companions that we care about. Please excuse any typos – this article was written with dictation software. Soon we will celebrate July 4th. Unfortunately for many of our animal friends this can also be a stressful time because of the loud fireworks that many people set off. For many animals, fireworks can seem like the world is ending and every year animals injury themselves by trying to escape out of houses or by running away and getting lost or hit by cars. If you have an animal who is afraid of fireworks or a new animal in your household this is a good time to be home with them if at all possible. Here are some things you can do to avoid stress and injury to your furry companion. Not everything works for every animal and many of these suggestions can be used in combination. Some animals get such severe anxiety that they need to be sedated with medication, so if your animal falls under that category this is the time to call your veterinarian. 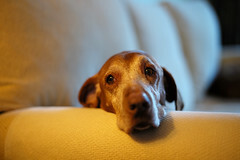 Most of the suggested products below can be purchased at natural pet supply stores or online by clicking on the links. Put on loud music or turn up the television to cancel out the noise. 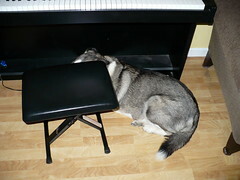 If your animal is prone to stress I would suggest classical or other calming music. Use pheromone sprays such as Feliway for cats and D.A.P. aka Dog Appeasing Pheromone for dogs to calm them down. The comfort zone products are the same as the vet products that are called just Feliway and DAP but are cheaper and can be bought at pet supply stores. Spray a natural lavender product around the house. Lavender can be very calming but make sure you use a natural product and not one full of chemicals. Do not spray directly on your animal. Bach flower remedies such as Rescue Remedy can be very helpful for stressed animals. These are homeopathic in nature and very safe for even the oldest of animals. Put a few drops in their mouth or on the ear and a few drops in all the drinking bowls in the house. My Kingdom of Basil Calm and Peaceful formula is great for taking the edge off anxiety in dogs. Animals’ Apawthecary’s Tranquility Blend works well for anxiety in both cats and dogs. However check with your veterinarian if your animal is on any medications or has any major health issues before using these. Wearing a T-shirt, Thundershirt , or Anxiety Wrap can help your dog if they have problems with anxiety from fireworks. It sounds weird I know, but it actually does work. It is based around the ideas from Tellington TTouch of using an ace bandage. Wearing the shirt enhances your dog’s sense of their own body and makes them feel more confident in their movements and behavior. You can use a snug fitting human T-shirt, a Thundershirt , or an anxiety wrap. If you are home, talk to your animal calmly and rub them gently. If they become agitated try to stay calm. Your stress will only make them more stressed. Make sure all windows and doors are closed. Do not leave your animal outside. Have a wonderful 4th and thank you for visiting! Move Kingdom of Basil into its full potential Truthfully this year we did a lot to just get it off the ground. In the new year I would like to see our wonderful clinic become full of many practitioners with thriving businesses and hopefully get the store up and running. We are on our way with two news practitioners starting in February. Joleen Black, EAMP will be working with people with acupuncture and herbs and Erika Nelson, DMV, CVA will join use doing acupuncture and herbal medicine for animals. In addition Jen Streit, SAMP will join use helping with the herbal business. Get the book out! I had no idea how easy it is to get bogged down with editing. The integrative care animal cancer book will remain forever available online but I would like to get it out on ebook and paper form. Blog more I have to admit it has been hard to find time to write lately with getting the clinic up and running but I love to share knowledge and I hope to have time in the new year to do more of that. Make more herbal products – I love making salves and new formulas and playing with my herbs. I want to make more fun products to share with you and your animal companions! Grow, share, reach the world I am so inspired by being able to reach people all over the world. I want to continue to see more and more people and their animals benefit from what I can share. Keep things open I truly believe that you can make a living off of sharing information and not having a “sticker price” for knowledge. See A World of Sharing and Trust – Why Everything on Path With Paws is Free and Sharable. I want to continue to prove this. Please share everything I post with friends, relatives, co-workers, your vet, your animals! Here’s to a wonderful 2015! Posted in general information | Comments Off on Welcome to 2015! You are invited to an open house! We believe that families can include many species and that good holistic health should not be limited to just people. We provide holistic health for the whole family through acupuncture, massage and naturopathic medicine. 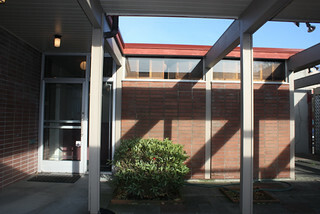 Our new clinic is located in the south end of West Seattle. Please come and see our new clinic, meet our practitioners, and learn about our herbal business. Animals welcome as long as they can get along with others and are on leash. Posted in general information | Comments Off on You are invited to an open house! I hold no special magic that others can’t have. I do write a lot, I try to write articles that others can follow and that give good solid information. There are many vets out there that do what I do and do it well but don’t write articles. I don’t know them all. Many of them don’t know me. Part of why I started writing is that I was one person and only one person. I could not help everyone who needed my help, even just in my city of Seattle. There was only so much of me. I received calls and I had no appointments for weeks or months. Peoples’ animals were dying and I had no time to help. So I began to write and I found in writing I could help more people and I was able to use a talent that I have had since I was young. The ability to share part of who I am through words on paper. I do hold magic, its just not unique to me. I know how to put love into what I do. I know how to appreciate animals and people for who they are and where they are at. And I’ve learned to use the incredible brain I was given that processes medical and botanical information well (but can’t spell the most simple of words – thank good for spell check) and combine that with the intuition that comes from my heart. I’m grateful for this. The more I write, the more emails and phone calls I get asking me to help specific animals. I can’t help them all. I know that every animal out there is unique and loved. And it pains me that I am not able to help every furry companion and family member. My main magic lies in those animals I can see in person, with people I can look in the eye and guide. I can’t do what I do best on a phone, over distance. When I write an article it helps thousands of animals. I need to keep my blogging work on articles and my local practice on seeing animals. I know people will continue to ask, I know I will continue to hurt that I can’t reach out to everyone individually. But there are other great veterinarians out there that can guide. Nothing compares to having someone in your community to guide you through your animals’ chronic illnesses. It is not a one stop visit with chronic disease. Sometimes that guide is a great western veterinarian, more and more I find that my profession is opening to some of the holistic medical options. Many times it is a wonderful holistic practitioner. 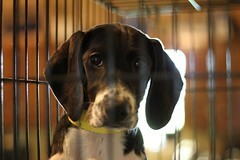 I know there are those who will be their our guides, those that live 500 miles from the nearest holistic veterinarian. I have tried to make my articles the most straight forward yet detailed I can. Consider taking them to your western veterinarian and discussing. We need to get more veterinarians interested in holistic medicine. There is nothing as frustrating as having a chronic disease without options. If there are no good western options many vets will be open to something more unconventional. I know this article doesn’t help animals. It helps me. I have tried in so many ways to express this to everyone who asks for help. I can’t type it any more. Thank you for listening. Treating and stabilizing cancer and chronic disease long term is sometimes like learning how to ride a bike. At first it feels impossible and every small setback or fall you think I can’t do this, this is the end. However at one point you realize that you are going on your own and that you actually have a lot of power in this process. Ok so maybe a bad comparison. Bikes don’t normally kill you and most of us learn to ride them eventually. But I have found one of the hardest things for people with companion animals with cancer is that they have no control over the process. They see their animal suffering. They are told they are going to die. And then they are left trying to figure out what direction to go and that becomes extremely difficult to decide with someone you love. In addition when they turn to the Internet they are blasted with an amazing amount of articles, supplements, stories about what you should do for an animal with cancer and chronic illness. It is almost impossible to find a right course. I have seen that even when people have their dogs or cats on multiple cancer supplements/treatments that they go back again and again to the internet hoping for a new article, a new cure. There is no solid cure for cancer and many other chronic diseases. However there are many things that help to control the pain and symptoms and sometimes we get cures. But one of the most important things for any practitioner working with people who are facing cancer or chronic illness in a loved animal is to make these wonderful people part of the cure. It is only natural that when we see our animals suffer that we want to help. We don’t want to be the one in control but we do want to have something we can do that gives us some control and some power over suffering. This eases anxiety and turns worry into actions. I find it is different client to client but I try to add in some treatments they can do at home. Acupressure points that help with stimulating the immune system. A diet or additives they can cook to help with health. Topical treatments that can be applied at home. Medication for when there is pain or nausea or other difficulties. Herbals that they can lovingly mix in with their dogs’ food, that actually help and work. While I do have people use capsules if an animal will not eat the herbs I provide, my preference is for the whole herbs I make that smell good and fresh. If people do use capsules they are filling them on their own which also involves them in the healing process. In my own herb business we have a rule that herbs can only be made if you are in a good place. If anyone is in a particularly bad mood they cannot make herbs, because their energy can effect the herbs. The funny flip side of that is that the herbs seem to make all of our moods better. If I am in a bad place I simply go sit with the herbs for a while and the world seems better. Every herbal we make gets a hand drawn heart on the package. That is the love that is added. I learned that years ago from my first herbal teacher’s wife. Always add love, it does make a difference. I know that was a bit off topic but I guess what I am trying to say is that in medicine we have worked so hard to remove the connection between medicine and love. Love can be medicine and when we involve people in their animals’ treatments, we are adding love. And that is no small thing. We are all connected, let’s use that connection to heal! Kingdom of Basil tinctures now available for cats (and smaller dogs)! My cat clients have long had the benefit of being able to use my specially made herbal tinctures. For the first time they are now available on etsy! While any of my herbal mixes can be made into a tea for the kitties, the tinctures come made to give. All my tinctures are made with love and with glycerin instead of alcohol so they are not too strong on the tongue. I can’t say that cats like my tinctures because they do still have a herbal taste and let’s face it, cats don’t like anything that is put in their mouths by someone else. However, they go down easier than most of the medications out there. I am starting with offering my four most commonly used tinctures in the one ounce size. Constipation support combines cascara which promotes gut motility with licorice root and ginger to prevent painful spasms in the colon. Heart, brain and blood pressure support contains hawthorn and ginkgo which help regulate blood pressure, improve blood circulation into the brain to help with memory and support healthy heart muscle. 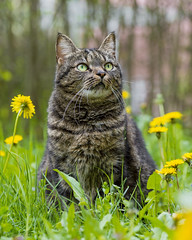 I often times combine kidney support and anemia support for cats with both kidney disease and anemia. Many cats with kidney disease also have high blood pressure, so sometimes kidney support gets combined with the hawthorn/ginkgo combo. I can also make either of these combinations. The constipation support I always use as a separate tincture. I hope these tinctures additions are able to help more of the kitties out there! And I’ll be adding more formulas and sizes as we move along. Posted in general information | Comments Off on Kingdom of Basil tinctures now available for cats (and smaller dogs)! I have long wanted to expand my practice and have a clinic where not just animals but also their people could go for excellent holistic health care. Today we bought a building in West Seattle where that dream can come to life! I am very excited to introduce you to Kingdom of Basil – a wellness clinic for companion animals and their people and a small herb shop for animals. I have long believed that our healing between people and their animals is connected. Good health for us helps our animals and good health for our animals helps us. I have a wonderful group of practitioners who are going to be part of this adventure. In addition to my own practice, we will have massage and acupuncture for people and animals and naturopathic medicine for people. I’m hoping to expand the herbal shop to people in the future and be able to offer some classes and support groups as well. Diane will be with us full time running the office and will be able to meet and help many of you in person that she has only been able to meet over the phone. She will still work on Saturdays at Lien Animal Clinic. We are hoping to move in April 1st and begin our journey. This date may change as we get the clinic ready to open. In the meantime please check out Kingdom of Basil’s website for information on some of our practitioners. There are a couple people who will be involved without profiles up yet. If you are a facebook user please like our Kingdom of Basil page to get updates on our progress. I promise to send our more updates to you as we move along in getting things ready to move in including directions to the clinic. For those of you that are wondering, our new address will be 9431 17th Ave SW, 98106. We are excited to join a part of West Seattle that I feel like is rapidly changing and growing! Long overdue, here are short descriptions of the formulas sold through my etsy shop, Kingdom of Basil. Please click on the names for more information about the formulas (when available). Back Support Formula – I use this formula mostly for animals with disc disease and conscious proprioception deficits (i.e. toes drag or turn under) and/or pain related to nerve or disc compression. Bu Zhong Yi Qi Tang/ Chemotherapy Support Formula – This formula helps to support animals going through chemotherapy. It especially helps to support the immune system. Calm and Peaceful Formula – This formula is used to calm down anxious dogs. It should not be used in cats. Cat Kidney Support/Liu Wei Di Huang Wan – this formula supports older cats with kidney dysfunction. Eight Treasures – This formula helps support the immune system and digestion in older and weak dogs. It can be especially helpful for dogs who are emaciated. Heart and Brain Support – Containing ginkgo and hawthorn this formula supports blood flow, brain function and heart function. Jade Wind Screen – This formula is used to stimulate the immune system and work with animals with chronic or reoccurring respiratory infections. Liver Support Formula – This formula supports the liver especially in animals with elevated liver enzymes. Modified Chai Hu Jia Long Mu Li Tang – I mainly use this formulas for animals with hemangiosarcoma of the abdomen or heart. Modified Hoxsey – I use this formula for many of the cancers that are inflammatory such as osteosarcoma, squamous cell carcinoma, and lymphoma. Works best in dogs who run hot. Boneset can be added if there is bone involvement to help with pain. 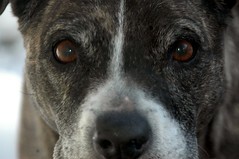 Senior Dog Support Formula – A supportive formula for older dogs with joint issues. This formula helps with longivity, organ health, pain and mobility. Shao Fu Zhu Yu Tang+ – A formula I use for animals with tumors in the lower abdomen especially the kidneys, prostate and bladder. I often pair this formula with Xiao Chai Hu Tang. Si Miao San – a strong anti-inflammatory formula. Used to support dogs with Cushings, it can also help with inflammatory disease of the skin, gut and joints. Many of the dogs that do well on this formula run hot but like to sunbathe. Xiao Chai Hu Tang – This formula is one of the most widely studied for cancer worldwide. It is very helpful for cancers of the abdomen, lung metastasis, and lymphoma. It is also supportive of the immune system and often used with chemotherapy. It can help with chronic cough. It treats a Chinese syndrome called Triple burner obstruction. It is also used in some autoimmune diseases. Xue Fu Zhu Yu Tang + – This formulas is often used for tumors of the upper body and for lung metastasis. It can also be helpful for skin cancers, especially mast cell tumors. It is often paired with Xiao Chai Hu Tang for cancer. It promotes healthy blood flow to the lungs and is also used to support dogs with chronic and acute cough and/or heart disease. I’ve been really enjoying exploring some new products recently. I’ve always wanted to make a good anti-itch shampoo for dogs and today I made one that I think will be excellent. Here is my ingredients. My herbals are a combination of a formula called Xiao Feng San which really helps with itch, calendula flowers to sooth the skin and oregon grape to fight any infection in the skin. First I made a tea out of the herbs, boiling everything together and then straining. Here’s the final product. Tea, jojoba oil, aloe vera, castile soap and lavender essential oil. Put herbs in a pot with water, bring to a boil and reduce heat, let simmer for about 20 minutes. Cool and drain. In each shampoo bottle put 8 ounces of drained tea, 3 tablespoons of aloe vera, 1/4 teaspoon of jojoba oil, 3 ounces of castile soap, and 20 drops of lavender essential oil. Mix and use. Shampoo will have some sediment from the herbs. It is best to wash an itchy dog with lukewarm water. I buy all my shampoo making products from Mountain Rose Herbs. Xiao Feng San can be purchased through my herbal shop Kingdom of Basil.